Belle Epoque toi and moi engagement ring with two one carat diamonds: Description by Adin Antique Jewelry. From within their platinum crown setting of this 14K red gold "toi et moi"-engagement ring crafted during the Belle Époque period, two certified old European cut diamonds both of no less than one carat frolic with each other as if Cupid caught the sparkling fire of two unified souls and stored it in these diamonds for their light to last forever. Theme: Toi et Moi ring - The French call this shape of rings "Toi et Moi" which means "You and me". Material: Two tones of precious metal, the main part being 14K red gold and the white parts are either white gold or platinum. 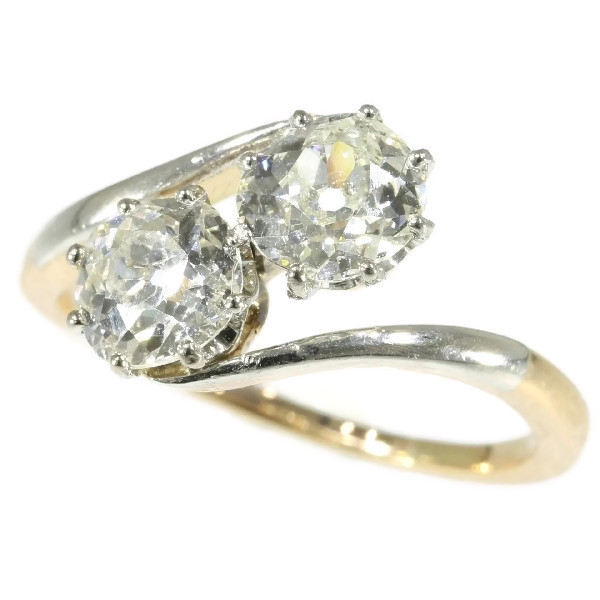 Diamonds: Two old European cut diamonds with a total weight of 1.99 crt. (one stone 1.00 crt. H/vs1, and the other 0.99 crt. I/Si2) see pictures for the certificates. Total diamond weight: approx. 1.99 crt.